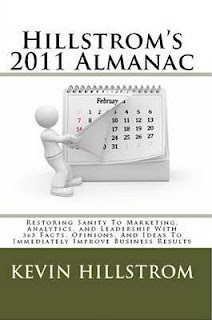 Kevin Hillstrom: MineThatData: Get Your Almanac Before 2011 Begins! Get Your Almanac Before 2011 Begins! Seems like now is as good a time as any to secure your copy of Hillstrom's 2011 Almanac. Honestly, you don't want to order the book in April and miss out on daily tidbits for three or four months, do you? Nook at Barnes & Noble, $7.95.